For a diabetic, unbalanced blood sugar levels is one of the biggest challenges. Any kind of imbalance in these levels affects the mood, weight and brings in its own stress to the affected person. The side effects can include an urge to urinate frequently, changes in the weight, vision problems as well as headaches. If left unattended these problems can lead to serious issues that can prove to be fatal. Though medications can help keep these levels at a check, it is important for a diabetic to also ensure that they follow a rigorous diet and a good form of physical activity that they follow without any excuses. 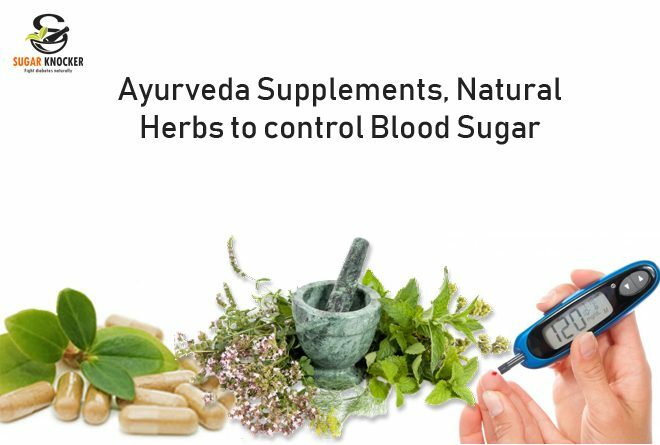 Ayurveda stresses on a good supplement regime through the use of various Natural herbs to control the sugar. This will ensure that blood is cleansed which also ensure good circulation in the body. The use of natural herbs and products can fetch marvelous results. Bitter foods: Vegetables such as bitter gourd, aloe vera juice, bay leaf, methi is extremely good for diabetics. You can have them stir fried or consume the juices on empty stomach. Try some cool recipes but just make sure that you inculcate them in your daily diet. Amala and turmeric powder for diabetes are also good. bitter melon is really good for diabetes patients. Spices: It is astounding that Indian cooking so easily accommodates the use of spices. Whether it is cinnamon, clove, nutmeg — each one of them comes with great health benefit that can help in maintaining the blood sugar levels. As easy as it is, you can just boil them all and have it in your tea. Vijaysar Churna: One can consume this magic herb in the form of powder that can be mixed with warm water or a spoon of honey. If not the cube can be kept in water overnight and can be had on an empty stomach in the morning.Triphala: This is another ingredient that can help maintain the blood sugar levels in the body. Triphala: This is another ingredient that can help maintain the blood sugar levels in the body. The decoction of equal parts of Triphala, root of barberry, colocynth and moth (20ml) may be taken along with turmeric powder (4gm) twice a day.Jamun Seed powder or Amla powder: These are very powerful herbs that come with loads of health benefits for diabetics. Jamun leaves are equally good and can be chewed or boiled in water and consumed. Amla is good for many reasons other than your hair. Discover the power of this herb by making interesting recipes including jams, spreads and a lot more. it is really helpful in diabetes treatment. Banyan tree bark: Yes, you heard it right. You can boil the powder in water till the water level is reduced to half. If not you can mix it with honey or mix in warm milk and drink it. Gymnema Leaf: Commonly known as Gurmar, it is established that this herb helps in maintaining the insulin Gymnema augments the insulin level in the body and enhances pancreatic cell growth, further assisting insulin production in the body, as insulin is made in the pancreas. it is also improves insulin sensitivity. As important it is to have these herbs and supplements, it is also essential for a diabetic to stay away from processed food. Ensuring a lot of leafy vegetables, fruits and less consumption of carbohydrates can keep a tab on the blood sugar levels which will not worsen the effects. Ideally the diet must consist of 50% vegetables, 25% protein, and 25% whole grain or healthy starches. Along with this a diabetic must get ample physical exertion to make sure that the diet fetches the benefits it promises.